Most local people are aware of the area in High Blantyre known as Crossbasket, due to the large stone house of the same name currently under restoration. The area was locally known as Basket, as some of it still is today. In the early 1500’s an old stone standing cross is thought to have stood close to the old tower on Crossbasket House, at the bottom of sloping woodland. The area was a religious hotspot and monks are thought to have lived there in a now lost monastery complete with graveyard. Today, there is no sign of a cross, monastery or cemetery. However, the cross is believed to have stood across the road from Allers Farm on Stoneymeadow Road. Several local historians have mentioned that the stone cross likely gave the name to Crossbasket area itself. I wish to put forward another suggestion. On this old 1816 map, the main roads, essentially dirt tracks of the time, converged right in front of Allers Farm. This was long before the Stonemeadow Road was built. Just slightly up from the General’s Bridge, the road split into “Puddock’s Lane” and “The Chainlink Road” leading up the braes towards East Kilbride. You can still enjoy these walks today which are more like lanes through woodlands now. It’s still possible to see the old kerbs of the tracks. On the opposite side at the Calder, the High pass on converged in front of Allers and split into a track leading up to East Kilbride i.e The Turnpike Road, roughly in line where Stoneymeadow Road is today. In other words, all roads met at a Crossroads. It was the Basket “Cross”. I believe this to be a more acceptable origin to the Crossbasket name, but there may still be truth in the old stone theory. The record of a circular monks graveyard existing in Crossbasket is of utmost fascination to me. There is no visible evidence of such a cemetery, but it was recorded in the Annals of Blantyre as late as 1885 that the Crossbasket Cemetery was beautiful and carpeted in soft flowers. The “Bas-Gait of old language also meant “low road” which may have lended towards the use of the name. Interestingly, Allers farm, which is currently dog kennels, is steeped in history associated with dogs. 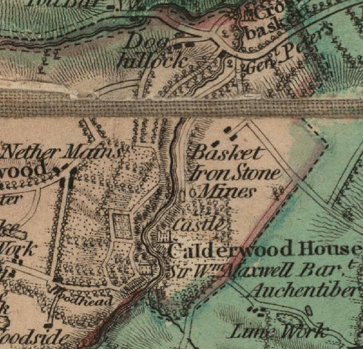 The small hill that the kennels stand on, was originally known as “Dog Hillock” as in the 1700’s it contained the kennels of the nearby Calderwood Castle (no longer there). On a personal note, i love investigating this area and i am by no means finished. Hi Paul, the article should have read Calderwood Castle. Updated now. Well spotted and apologies for any confusion. Thank you for taking the time to reply Paul. To be honest no confusion, I was excited about a new place that previously I was unaware of 🙂 lol I am loving your site Paul, so much information and so many great pictures. Its my new guilty pleasure! In the above you mention “Craighead Castle”. I was wondering, is this the same Craighead house that once stood near Bothell bridge or something altogether different. I only ask as I have a fascination with local historical buildings and ruins and have never came across this castle before.